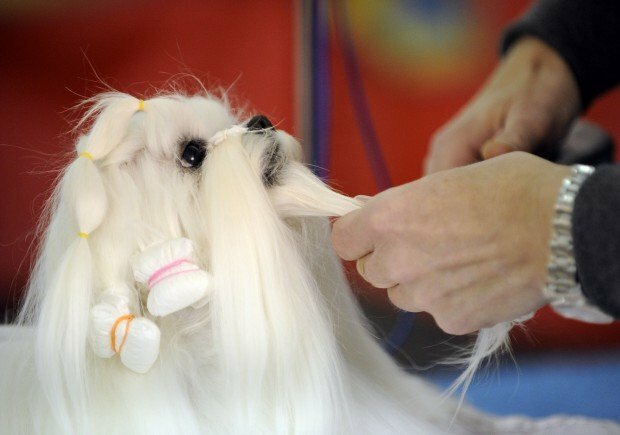 Jeffrey Fehder - jfehder@poststar.com Daddio, a two-yaer-old maltese is styled by owner Tim Lehman, of New York City, during the 26th annual Northeast Winter Classic Dog Show at the Adirondack Sports Complex dome in Queensbury on Saturday, January 30, 2009. "I see alot of familiar faces here," says Lehman about the dogs in this weekend's competition. 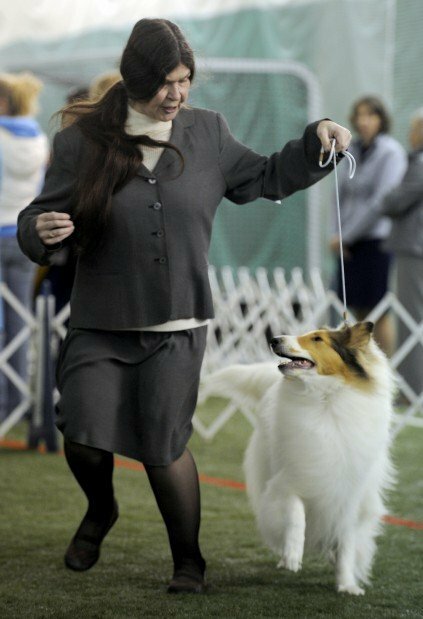 Jeffrey Fehder - jfehder@poststar.com Handler Deb Corrado shows her collie named Stormy during the best-in-breed competition of the 26th annual Northeast Winter Classic Dog Show at the Adirondack Sports Complex dome in Queensbury on Saturday, January 30, 2009. Jeffrey Fehder - jfehder@poststar.com Barry Tompkins clutches his Italian greyhound named Velvet while waiting to enter the ring during the 26th annual Northeast Winter Classic Dog Show at the Adirondack Sports Complex dome in Queensbury on Saturday, January 30, 2009. Jeffrey Fehder - jfehder@poststar.com Leslie Blancehette gives a trim to Brady, an English springer spaniel before stepping into the ring at the 26th annual Northeast Winter Classic Dog Show at the Adirondack Sports Complex dome in Queensbury on Saturday, January 30, 2009. Jeffrey Fehder - jfehder@poststar.com Chance, a two-year-old Newfoundland, sticks out his tongue while being groomed during the 26th annual Northeast Winter Classic Dog Show at the Adirondack Sports Complex dome in Queensbury on Saturday, January 30, 2009. Jeffrey Fehder - jfehder@poststar.com Lyzane Hamel receives a hug from her three-year-old Afghan hound named Pride just before entering the ring for the best-in-breed competition during the 26th annual Northeast Winter Classic Dog Show at the Adirondack Sports Complex dome in Queensbury on Saturday, January 30, 2009. "I come down from Montreal every year to compete here," says Hamel. Jeffrey Fehder - jfehder@poststar.com Handlers show their dogs during the great pyrenees best-in-breed competition during the 26th annual Northeast Winter Classic Dog Show at the Adirondack Sports Complex dome in Queensbury on Saturday, January 30, 2009. Jeffrey Fehder - jfehder@poststar.com Uli, a bulldog, gets her nails buffed before competing in the 26th annual Northeast Winter Classic Dog Show at the Adirondack Sports Complex dome in Queensbury on Saturday, January 30, 2009. "Uli is currently the #1 bulldog in the country," says handler Phoebe Booth. "She is something special." Jeffrey Fehder - jfehder@poststar.com Dogs and their owners perform some last minute primping and grooming before competing in the 26th annual Northeast Winter Classic Dog Show at the Adirondack Sports Complex dome in Queensbury on Saturday, January 30, 2009.